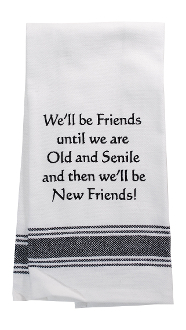 "We'll Be Friends, Kitchen Towel"
Towel that reads We'll be friends until we are old and senile and then we'll be new friends. A fun Towel proclaiming your love for friends and wine. Made from 100 cotton and made in the USA.